Dental implants is a famous restorative dental cure because of their efficiency and ease. A dental implant procedure is the finest solution if you lost one tooth or a whole mouthful of teeth. Implant experts can give you complete mouth refurbishment with mini dental implants and full dental implants. In spite of the nature of the trouble related to tooth loss, a full mouth dental implants clinic can give you a simple solution with proven results. No more awkwardness from shaky teeth. No more dental adhesives, gums and powders. A healthy jawbone and facial structure rather than Receding gums and a vanishing jawbone. Improved chewing ability, and need not eat soft foods only. Specialists Dental Care is the best dental clinic in Panchkula that offers you all sorts of help to ensure your dental health. We have performed several implants with great patient satisfaction. We have passed on this skill and experience to our entire team of dentists and para-dental team. All treatments are carried out by highly expert and specialised dentists to match the best of international standards. When you come to Specialists Dental Care you get a widespread, professional, personalised, and objective evaluation of your dental implant needs. 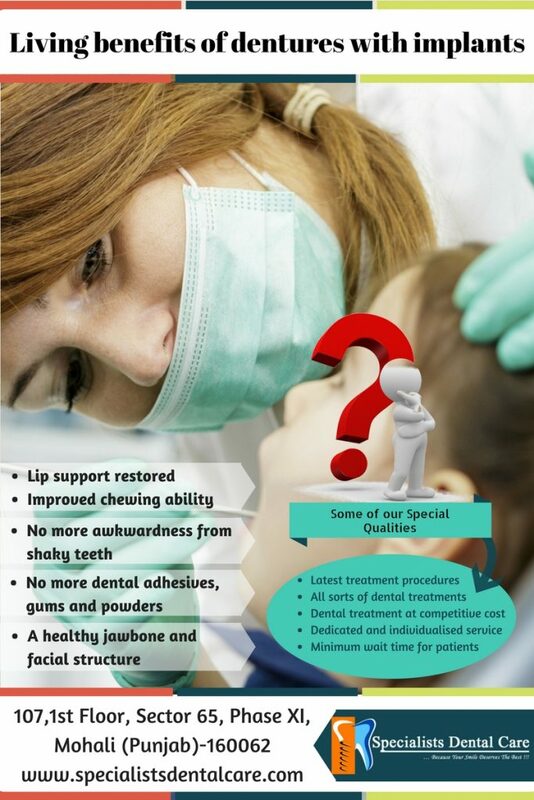 Our dental surgeons will then make clear these choices to you in clear, simple, non-medical terms. They will also explain any medical risks based on your medical history and oral habits. “We believe that a good dental health is a valuable souvenir and a timely preventive dental care enables you to lead a more fulfilling life.